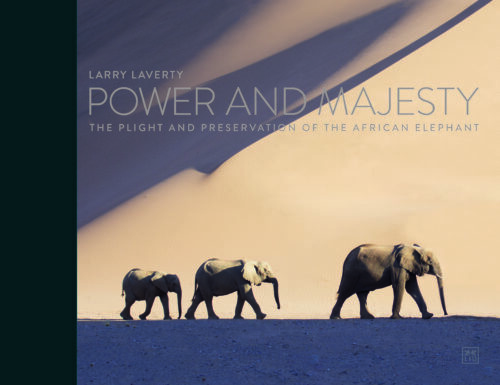 The first book by wildlife photographer and writer, Larry Laverty, Power and Majesty, features extraordinary images and informative text that captures the life of African elephants. The book focuses on these majestic animals and features stunning photographs from the most remote corners of Africa, from the savannahs and deserts, to the rivers and jungles. The text introduces various elephant habitats, explores the magical qualities of elephants and underscores the immense challenges they face for survival in a world dominated by humans. The photographs and information showcased in this book will help increase our appreciation and understanding of the African elephant's significant place in the animal kingdom, and Larry Laverty will be donating all of his profits to this worthy cause. Their abilities to love, to remember, to function as families and to survive under some of the harshest conditions will change the way we think about elephants, with the hope that this knowledge will encourage more people to help save those who remain in the wild.